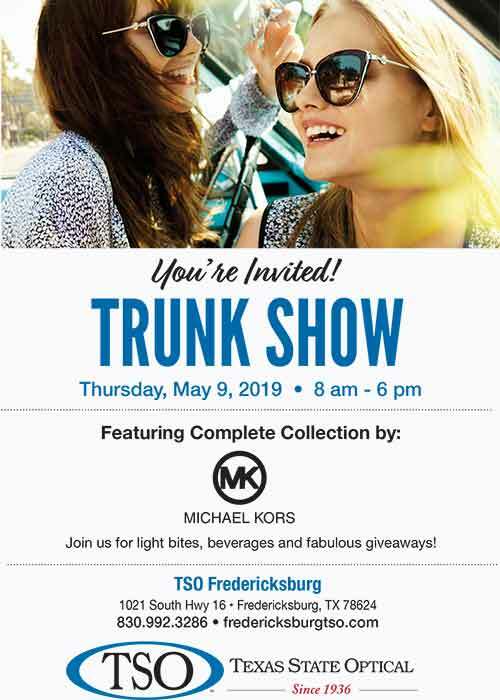 Exclusive Michael Kors Trunk Show Event! Thursday, May 9th! Born in 1962 in Kansas City, Missouri Kate Spade launched her line of handbags in 1993. Kate Spade now offers products in a range of categories. Once famous for creating her trademark black nylon bags, Kate Spade has built an international accessories business including eyewear. In 2004, Kate Spade shared her personal style and philosophies in her three books: Manners, Occasions, and Style. Kate Spade New York has over 80 retail shops and outlet stores across the united states, and more than 100 shops internationally. Products are sold in more than 400 doors worldwide, in every time zone and on every continent. Frames are fashionable and functional. Available in a large selection of colours and styles. Visit the Kate Spade website. Have Your Say & Review Us! I’m a part time Fredericksburg resident. I had an eye health issue recently that I was concerned about and didn’t have an eye doctor in Fredericksburg. Texas State Optical was close so I called and they were able to work me in right away. The staff and doctor were friendly, helpful, thorough and very professional. If you need an Optometrist in Fredericksburg, I definitely recommend TSO. I saw Dr. Anderegg, loved her! Very professional, caring and I will be back! Short wait time. Very impressed, worth the wait to get in! I see Dr. Anderegg & absolutely love her! She takes time & answers any questions thoroughly. The staff is knowledgeable & helpful as well. Definitely recommend them! I love everything about this office. I feel confident in my care and 2 of my friends have started going because of my experience. The staff is courteous, professional, knowledgeable and friendly. Counter staff was very helpful and friendly. I was greeted right away and my needs were met with a very helpful attitude. They made me feel right at home and completely comfortable. You can now purchase peace of mind with your new eyeglasses for only $29 at Texas State Optical Fredericksburg! Replace of your broken frames for a full year, no questions asked! Please feel free to call with any questions about the program, or feel free to visit us for further details. 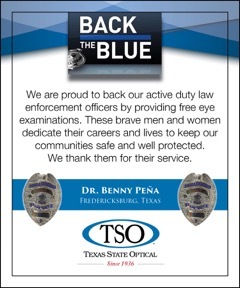 Thanks again for choosing Texas State Optical Fredericksburg.